Injecting drugs, also known as “intravenous drug use” or “IV drug use,” is a common way to abuse illicit drugs or even legal prescription drugs. An injection like this is typically (or ideally) done into the vein, but injecting drugs just under the skin, often called “skin popping,” is also becoming popular. Users may also miss a vein and end up injecting a drug into the muscle. Nearly all drugs can be injected by dissolving pills, powders, or salts into a liquid solution and using a hypodermic needle to get the liquid into a vein. This method is often preferred to ingesting a drug orally due to the fact that injecting a substance gets it to the brain much faster. Taking something orally means that the user must wait for the substance to be digested and absorbed through the intestines before it can get to the brain. This causes the drug to spread out in the system and take significantly longer to produce effects, resulting in a longer but less intense high. An injected drug, however, needs only to pass through the heart and respiratory system before the oxygenated blood is sent to the brain. This process only takes a couple minutes, and the drug mostly arrives at the brain all at once. This produces what is commonly referred to as a “rush” – an intense feeling of euphoria that may only last for a few seconds before it levels out into the standard high, which is over after around 15-20 minutes. Drug users who prefer injection are therefore much more likely to engage in bingeing behavior, taking more doses immediately after the high wears off. Switching to a faster method of drug abuse tends to be a sign of a developing addiction and increases the chance than an addiction will occur. Injection drug use also comes with new and more serious health concerns. Injection is associated with a high chance of contracting a serious disease due to the common practice of sharing needles, exposing users to blood-borne pathogens like HIV and the hepatitis C virus. According to AIDS.gov, IV drug use is responsible for around 10 percent of all new HIV cases each year. Repeated injection of drugs can also lead to other health issues over time. Especially since most IV drug users are not trained medical specialists, it’s easy for them to cause collapsed veins around the preferred area of injection. Although the blood can reroute to other veins, over time, this can result in poor circulation, which is associated with problems like infection and a higher risk of stroke. Injecting dissolved prescription medications presents a unique issue as these typically come in pills that often have a protective coating. It’s actually impossible to completely dissolve these, resulting in the injection of tiny particles into the veins. These particles can get stuck and build up in arteries, including around the heart and brain. The particles also tend to wear away at the heart muscle and can increase the chance of an artery rupturing. 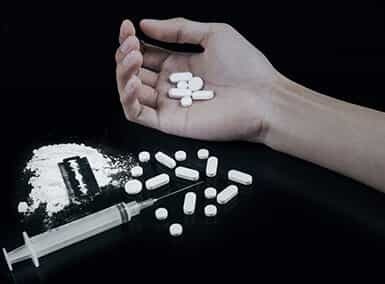 Injecting drugs is a particularly risky form of drug abuse and should be avoided. People who find themselves unable to resist the temptation should seek drug addiction treatment services as soon as possible. What issues can happen to the skin after repeated drug injections? Injecting drugs via needles can damage more than just internal organs affected by the drug. People who inject drugs, whether with syringes or IVs, can cause many different types of damage to the skin. This can be a result of injecting regularly, using potentially tainted needles, or injecting into fat or muscle by accident due to missing the vein, an error called “skin popping.” This can result in a painful lump that could potentially cut off blood flow to the area. Some of the skin problems that result from drug abuse occur because of the drug being used. For example, people who inject meth may sometimes feel a sensation like bugs crawling on their skin, which can cause them to scratch or tear at the skin, resulting in open wounds. This is exacerbated by the fact that meth can destroy the blood vessels near the surface of the skin, resulting in skin damage and inhibiting the body’s ability to heal the skin, as described in a report from Frontline. Why is a cotton ball used in the process of preparing a heroi injection? When a person is preparing to inject heroin, a small piece of a cotton ball is dropped into the liquid solution to absorb the drug, and then the needle is stuck into the cotton to pull up the liquid from the cotton, rather than from the spoon. According to the Center for Substance Abuse Research, the reason given for using the cotton is that it helps to filter out any impurities from the drug solution before injecting. However, another reason that some offer is that it simply prevents scraping the needle against the spoon, which can create a rough edge on the needle that can result in damage to the veins or skin when the drug is injected. Can you die if there are air bubbles in a drug injection? The first answer to this question is that it is possible for a person to die due to an air bubble in a blood vessel if the bubble cuts off the delivery of blood to the brain. This condition, described by Medical News Today, is called an air embolism, and it most often occurs in deep sea divers who return to the surface too quickly, resulting in air pressure that pushes air bubbles into the bloodstream. However, as described by a study from the journal Anesthesiology, the amount of air needed to create a potentially lethal bubble is fairly high – about 200 ml, which is equivalent to about three-quarters of a cup. For this reason, it’s unlikely that enough air can be injected by the syringes involved in drug use to cause an air embolism. Nevertheless, there is risk with any injected drug use of a variety of reactions that can cause severe health issues, including death. Where can you find a needle exchange program? Needle exchange programs can help people who are struggling with abuse of injected drugs to at least avoid the problems with shared, reused, or otherwise unsafe needles – at least until the person can get treatment. However, not all states or municipalities allow legal needle exchange. For this reason, it can be difficult to find a safe, legal needle exchange. Articles like one from VeryWell can help people find needle exchange programs in various parts of the world. In addition, there is a resource called the North American Syringe Exchange Network that provides information about the legality of exchanges in different states and areas, as well as resources to find the exchanges. In places where it is legal, however, the best bet may be to go through an addiction treatment program or through the state, county, or city government – as can be done in King County, WA – to find legitimate, safe programs.